Italy Tour – Rome Day 2! 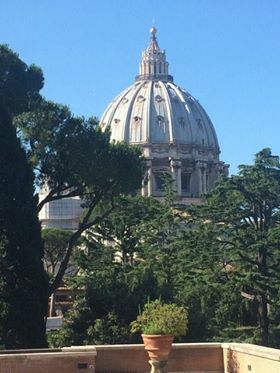 We had an early start today being on the bus at 7:45, which then took a scenic route to the renowned Vatican City. As you could imagine it is a very popular place, but with the help of our fantastic tour guide Adriana we took the fast track and promptly met up with our Vatican guide Rosanna. She was astoundingly knowledgeable and helpful whenever we had questions about the art or how to turn on our guide head sets. We saw so many priceless sculptures and extravagant hallways within the museum, including a spinning sculpture, as demonstrated by Rosanna. We were then led to the famous Sistine chapel. As soon as we entered both the choristers and the chaperones were in awe. We couldn’t help but take in the story of creation on the ceiling as well as the 100 plus body portrait on the front wall. Truly a masterpiece. 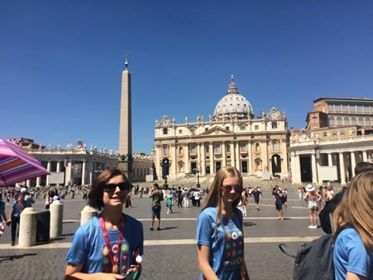 Reluctant to leave, we found our way out of St. Peter’s and were once again struck by the beauty, and the heat, of St. Peter’s square. 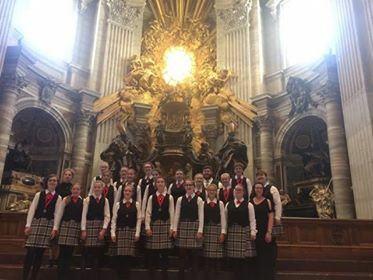 After a quick lunch and some well deserved gelato, we got into our concert attire and took a very sweaty hike up to the basilica. For the umpteenth time today we were taken aback. The intricacy and pure grandeur of the basilica was so incredible that we agreed no picture taken on an iPhone nor a Nikon could do it justice…. but we sure did try. Finally it was time to sing in the afternoon mass. Guided into the choir space by the music director David, we sang truly for the joy of it. 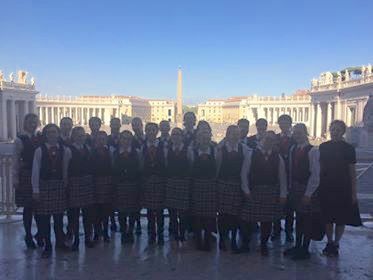 It was a lovely mass in Italian and Latin that brought us to the end of our first concert in Italy and it sure did set the bar high.